Quad-core couch potato. There are plenty of touch notebooks but cheap models available for less than 450 Euros (~$612) and in a flat, 14-inch format are quite rare. Lenovo launches its new S415 touch notebook and the question on our mind is: Is it more powerful and mobile than the slow S405? 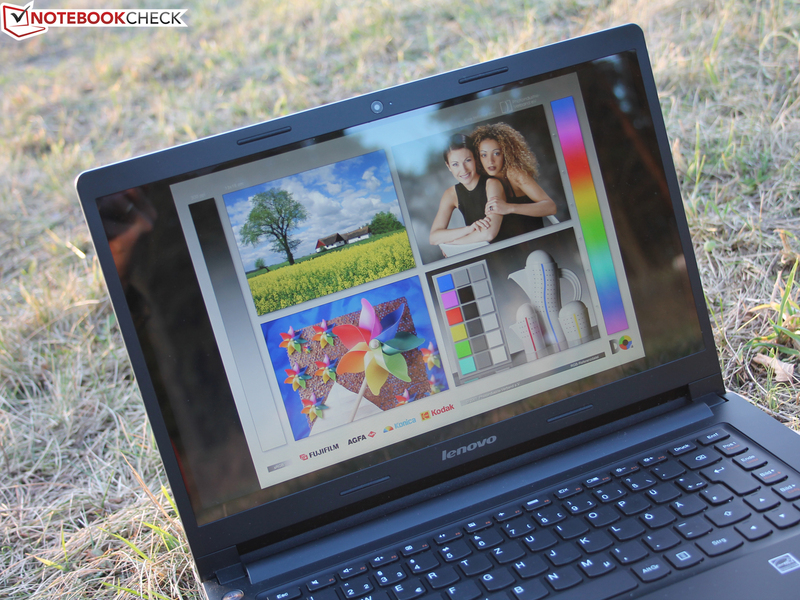 Lenovo IdeaPad S415: the ideal companion thanks to touch, runtime and low weight? Slim laptops are popular as ever: especially when they are cheap. 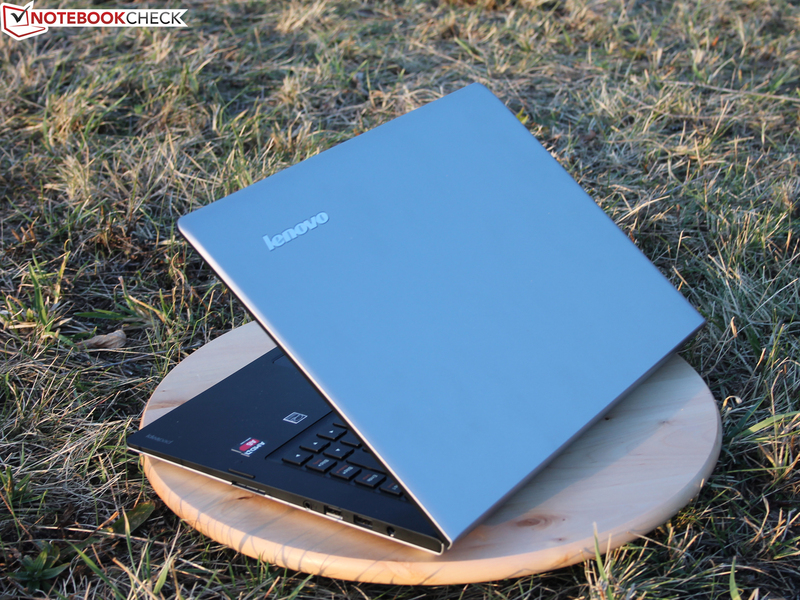 Lenovo launches a successor for its 14-inch model, which we previously tested. It all started with the IdeaPad S400 (Intel) and the S405 (AMD). The manufacturer has swapped out the weak Trinity APU (A8-4555M) in favor of the Jaguar successor, the AMD A6-5200 (Kabini). Can the 14-inch model keep up with the Intel competition of the 450 Euros (~$612) price class? The competition under 500 Euros (~$680) is limited, if you are looking for a 14-inch model with a touchscreen. 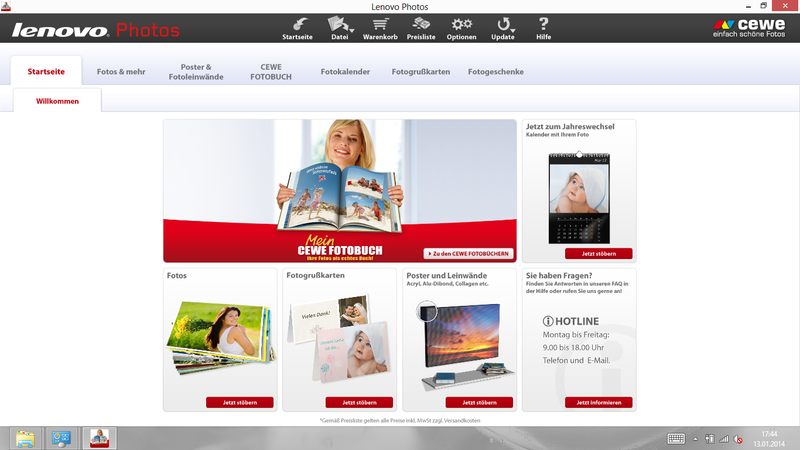 The Lenovo IdeaPad Flex 14 (version with Celeron 2955U, 449 Euros, ~$611) is probably the only alternative. 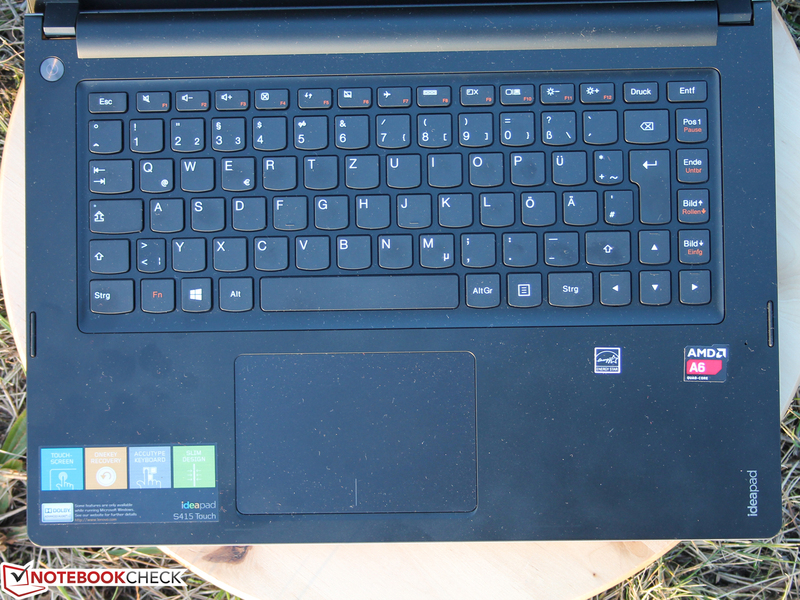 We tested the more powerful configuration: IdeaPad Flex 14 (i5, 700 Euros, ~$953). If your budget reaches 600 Euros (~$817), then you might be interested in the Asus VivoBook S300CA-C1049H (589 Euros, ~$802), Sony Vaio Fit E SVF-1421A4E/W (520 Euros, ~$708) and Toshiba Satellite U840T-101 (599 Euros, ~$815). 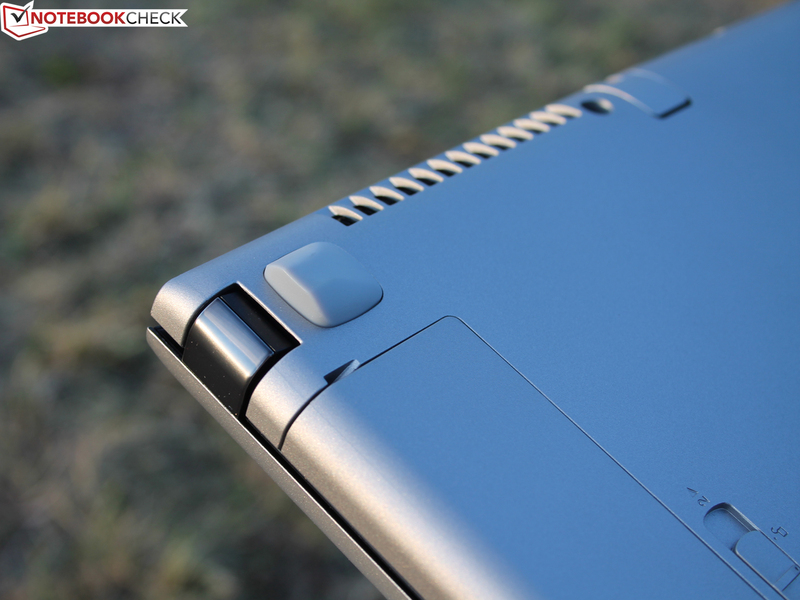 The IdeaPad S415 looks just like the S405 which came out at the end of 2012. As such we will only discuss in detail the differences between the predecessor and the successor and leave out details on the case, connectivity and input devices as they have stayed the same (mostly). Change: the rear feet are no longer as rounded as before, instead they are now pointed towards the back. The chassis of our test model is almost identical to that of the S405. Two small differences exist: the rear feet are more pointed and the non-touch of the predecessor has been replaced with a touchscreen. The display has a small border but the touch panel itself is half a centimeter shorter than the touch glass makes it seem. The weak construction of the base (sturdiness) is the biggest flaw. For more information, read the in-depth review of the S405. 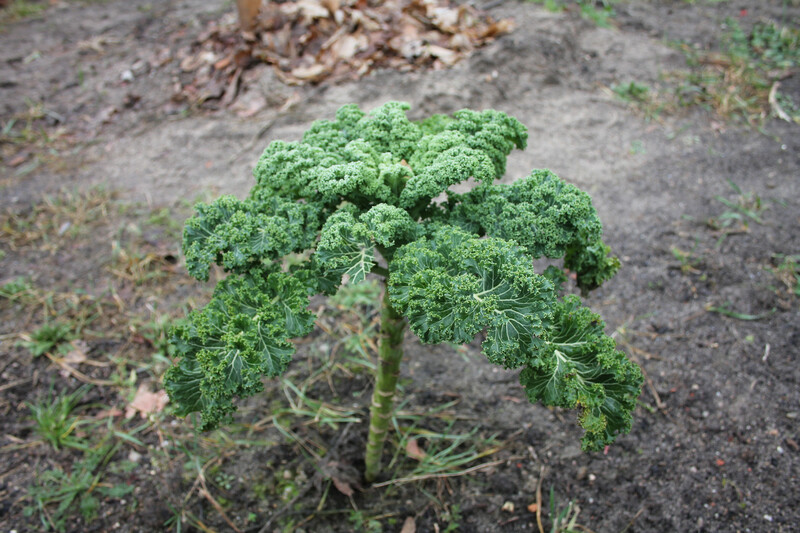 We have posted photos of the open device there. The ports are identical to those of the S405. The new OneLink port replicator of the ThinkPads and most Lenovo office models (like the B5400) seems to have been left out of the consumer line-up completely. The WLAN adapter (Atheros AR956x bgn) works on the 2.4 GHz frequency. The Ethernet supports only Fast Ethernet and not Gigabit-LAN. This technology is outdated. Bluetooth 4.0 is on-board. At a distance of three meters, the WLAN works great. It works just as well one floor above (10 m). However, when we go outside the house, the reception drops to three bars (15 m) and down to one bar at 40 meters. At this distance, we could surf notebookcheck.com. The output of the router (Fritz!Box 7270) was set to 100%. As such, we find this performance quite good as most laptops cannot keep a secure connection at 40 meters. 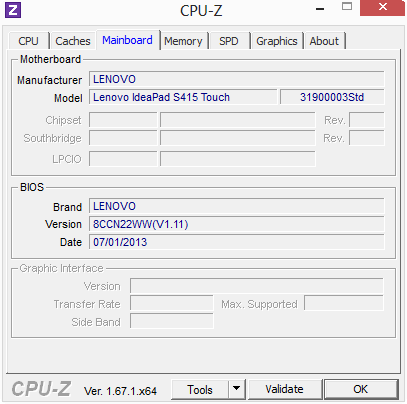 Lenovo has installed a slew of trial software. Aside from McAfee Internet Security and Nitro Pro 8 (trial), the laptop offers Lenovo Photos (commercial photo book service) and other commercial services (for ad purposes). The Engine Control Center belongs to the APU driver and allows the user to control the performance to a degree. The test model is delivered with Windows 8 64-bit. There are no recovery DVDs. 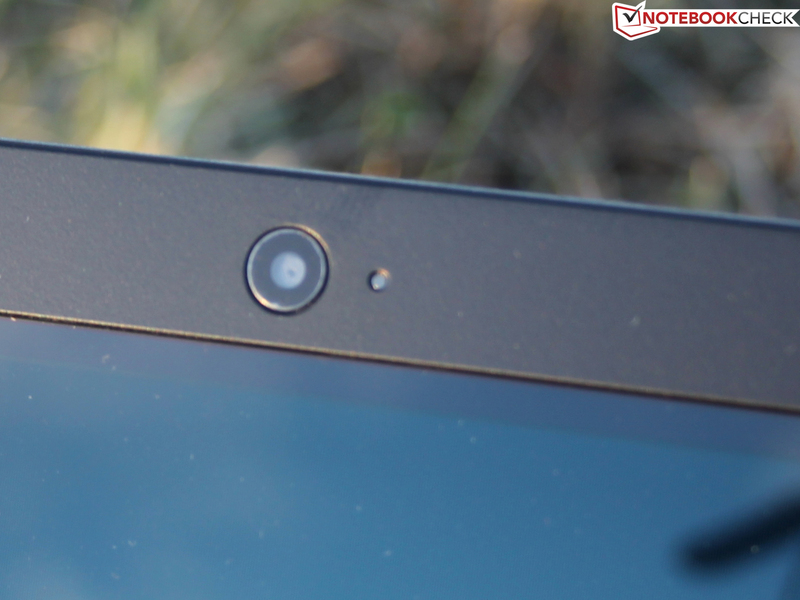 The user can use the OneKey Recovery to create a recovery DVD using an external writer. The OneKey button (left side) calls up the security/backup tool. 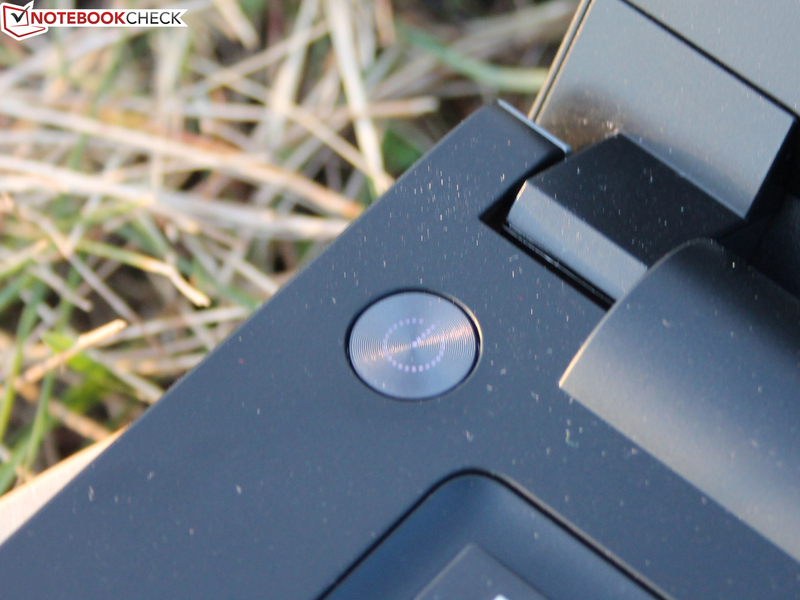 When turned off, the recovery mode on the hidden HDD partition is activated using this button. 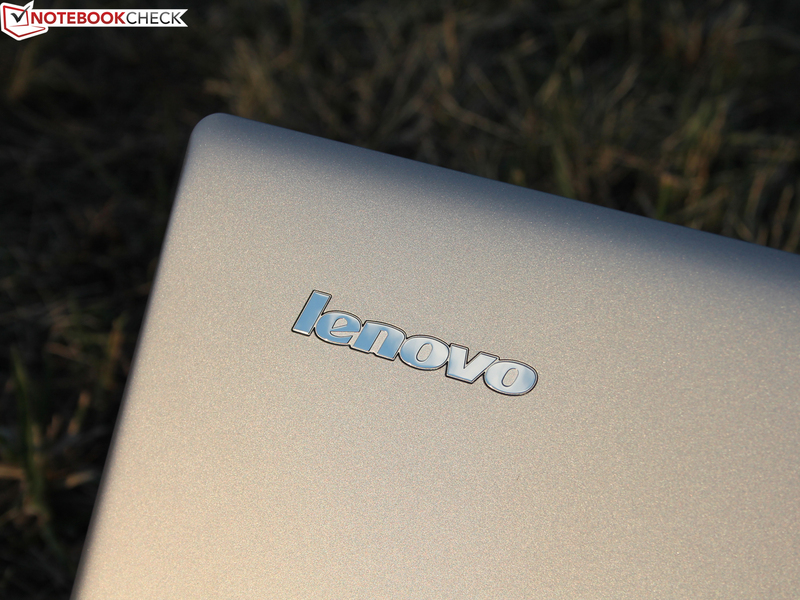 Lenovo offers a 24 month "bring in" warranty for the S415. The customer can send in the notebook in case of defect. 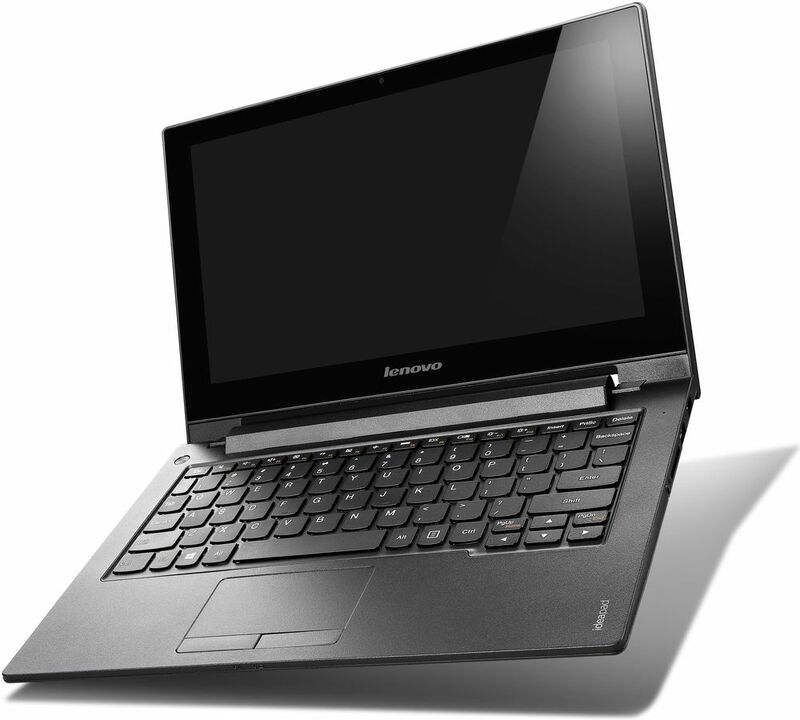 Furthermore, Lenovo offers a variety of warranty goodies: on-site service or extending the warranty up to 3 years. The prices are reasonable and can be seen at the manufacturer's website. The webcam has a 1280x720 pixels resolution. It takes blurry pictures, even in good lighting. As such, the camera can not be used to take snapshots. 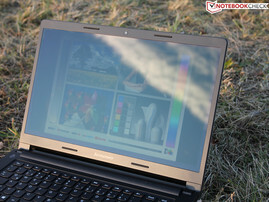 The input devices have stayed the same since the IdeaPad S405 which means that they are still useful but not perfect. See test. Keyboard: spongy feedback and weak keyboard base. ClickPad: short stroke distance, loud noise but very large. Like before, the panel is a cheap TN panel with poor viewing angles. Its name is B140XTT01 and it is produced by AUO. 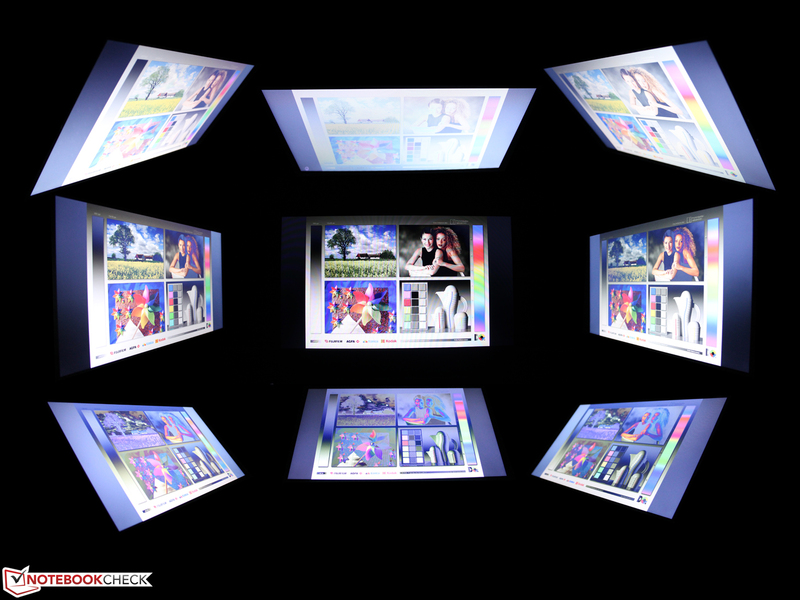 The panel offers a 1366x768 pixel resolution in the 14-inch form factor. Furthermore, it offers good contrast (733:1), but low brightness. The distribution of brightness is decent (82%). 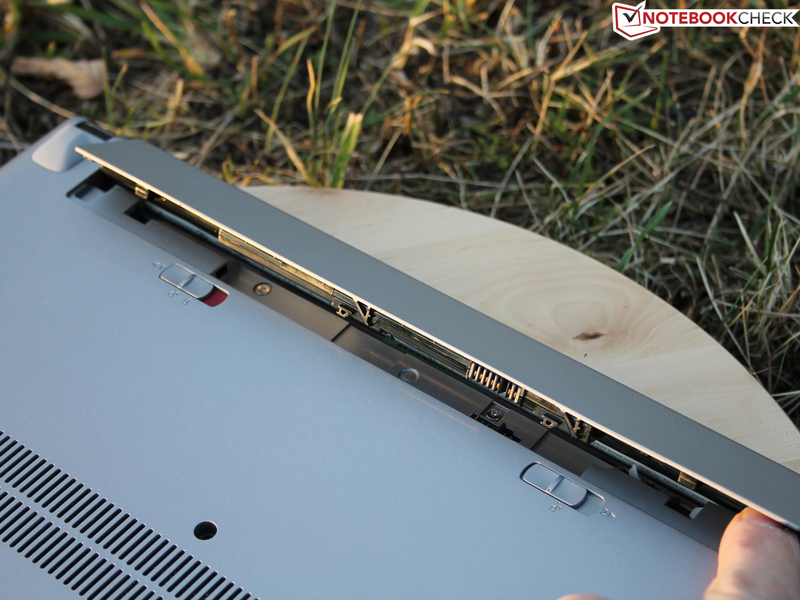 The VivoBook S300CA offers similar contrast (611:1) and the IdeaPad Flex 14 lags far behind (323:1). Let's take a look at the color space coverage. It's small: sRGB is 54% covered, whereas the AdobeRGB spectrum is 37% covered. Thus, this panel is not suited for professional graphics editors (the APU is wrong for that purpose too). Using the photo spectrometer, we measured the TFT before calibration. The gray levels show a significant blue tint, which is visible to the naked eye. The shift towards blue is also noticeable in the saturation. Except for green and yellow, all colors are strongly affected, which leads to a poor DeltaE average of 10. The brightness of the AUO panel is limited to 203 cd/m² which is good for indoors or in the dark. However, it is not enough to overcome the reflections in the daylight. 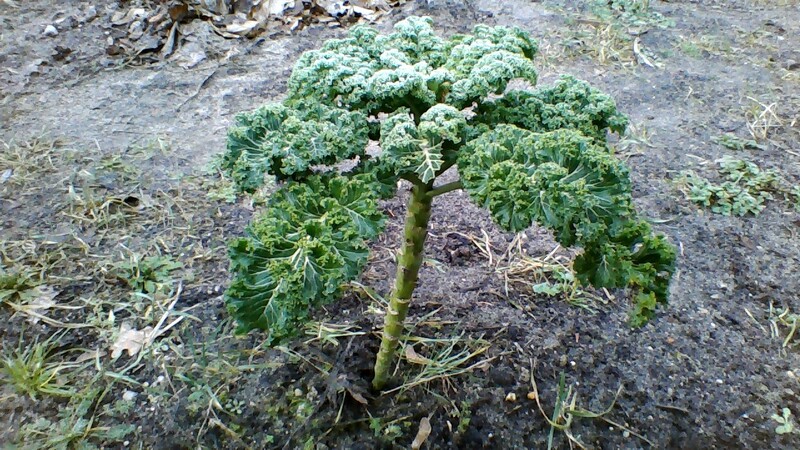 Our photos were taken in a relatively weak light in winter. Due to the good contrast, we could get a good picture in indirect lighting. However, to reliably use the screen outdoors, we would expect a brightness of at least 250 cd/m². Even slight vertical deviations (starting at 15 degrees) can lead to color inversions. Playing movies or viewing pictures with multiple observers can be a challenge: If you wish to get a good picture, you should sit right in front of the panel or at most, at 40 degrees (horizontally) from it. This is quite bad, but 60% of the laptops on the market offer similar performance. The two alternatives we offer in our review also have poor viewing angles (TN-TFT: IdeaPad Flex 14; Asus VivoBook S300CA). The AMD A6-5200 APU (4 x 2 GHz, TDP 25 W) from AMD's A-series is the main platform for manufacturers of cheap laptops. 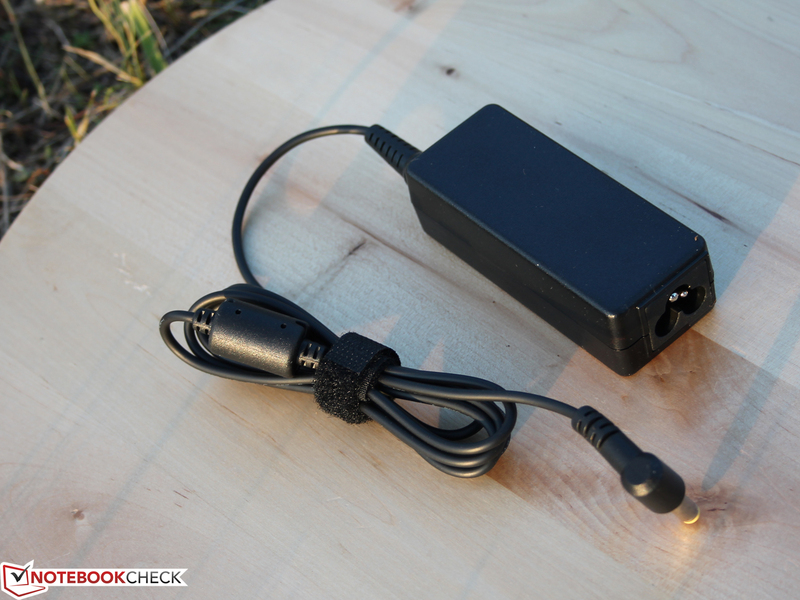 It is well-suited to small laptops due to its low power consumption. The weaker sister, APU A4-5000 (4 x 1.5 GHz), is also a Kabini CPU with a 15 W TDP and can be found in many laptops. The A6-5200 is still quite new in the CPU market. 4 GB of RAM in single-channel mode and a Solid State Hybrid Drive (500 GB + 8 GB cache) accompany the APU. The APU contains the AMD Radeon HD 8400 graphics chip, which also uses the DDR3 RAM. We posed a question at the start of this review: Can a new Kabini quad-core A6-5200 stand its own against the Intel competition of the 500 Euros (~$680) class? Thus, we chose devices for comparison which used the entry-level Intel processors, like Celeron (2955U) or Core i3 (3217U). The i5 models belong to a much higher price category and cannot be considered direct competitors, although they might be slim, well-equipped touchscreen laptops. 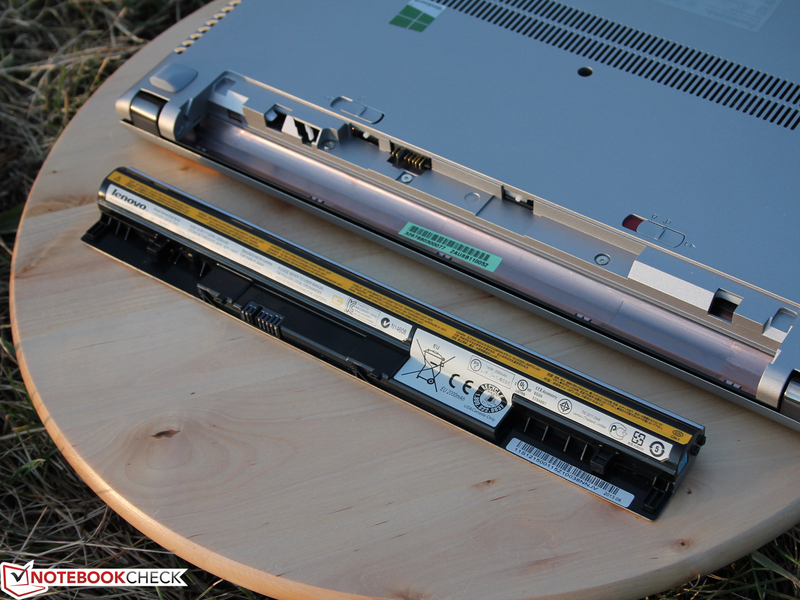 The following table is led by the Acer Aspire E1-532, which runs on the Celeron 2955U, which can also be found in the Lenovo IdeaPad Flex 14. In the multi-core 64-bit test, the A6-5200 surpasses the Celeron (-35%) and holds its own against the older Core i3-3217U (Ivy Bridge, +2%). In comparison to the old Trinity chip, our new APU has a 29% lead. The switch was well worth it, but during this time, the Intel chips have also gotten faster. 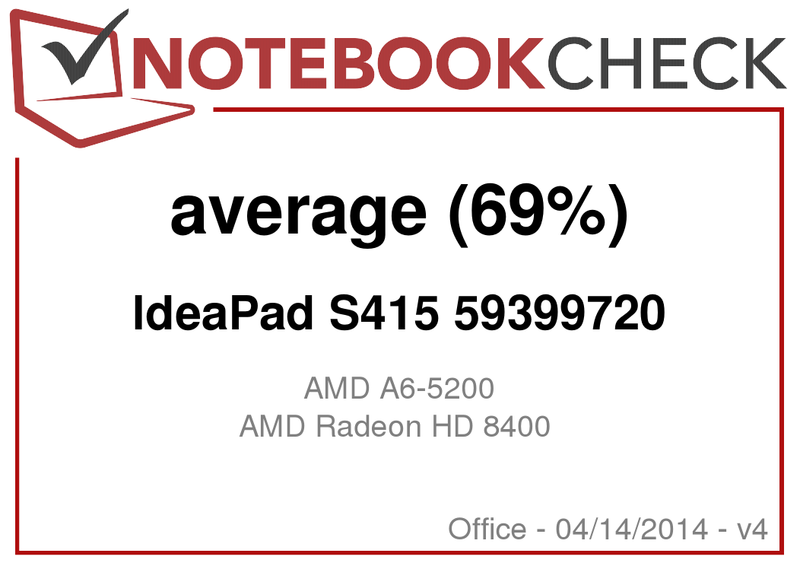 The A-Series A4-5000 (IdeaPad S215) is a little slower (-15 to -25%). The APU could even be installed in 15- to 17-inch models. The clock speed of 2.0 GHz (standard) stays constant during the test. The APU lacks turbo and the performance on battery is the same as when plugged in (according to the identical results in Cinebench R11.5 and OpenGL). We value the system performance more and for this we use PCMark 7 and 8. We lack the PCMark 8 scores for the Aspire E1-530, but the PCMark 7 results are much worse than those of our test model (-48%). 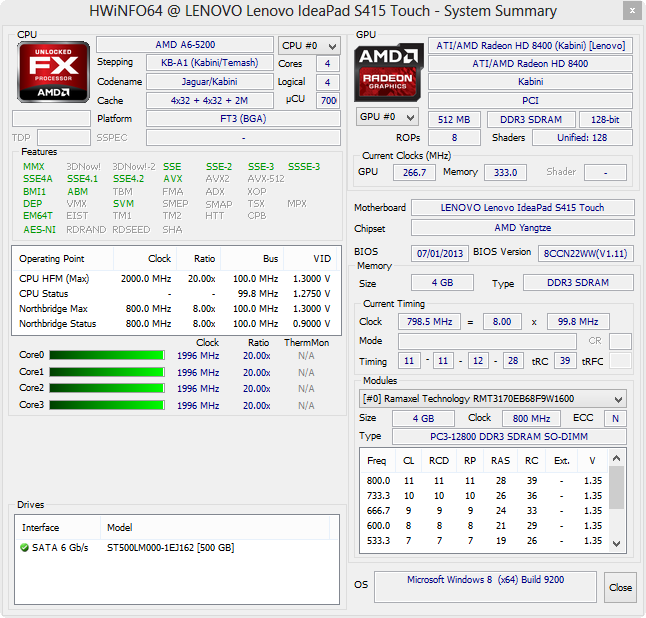 The Core i3 system performs better (S300CA) and is a whole 40% faster in PCMark 7. The S405 (Trinity) lies 37% behind. We find the S415 to be a sufficiently fast system. The user has to wait quite a long while starting it up but running multiple applications simultaneously is not a problem. If the HDD has to read a lot of data, then the speed drops quickly. A switch to an SSD could bring enormous boosts in this case. However, this would not be a worthwhile decision for Lenovo as this APU would not be attractive in a higher price class. The Seagate ST500LM000 Solid State Hybrid Drive (5400 rpm) with a total capacity of 500 GB is equipped with an 8 GB SSD cache. The HDD can thus access often used files quickly. This takes a little time and as such, the PCMark and HDD benchmarks do not benefit from it. CrystalDiskMark and HD-Tune record typical values for a 5,400 rpm HDD. The write 4K (4.42 MB/s) is amazing: usually only eMMCs or SSDs can score this high. The cache must have been responsible for this one. 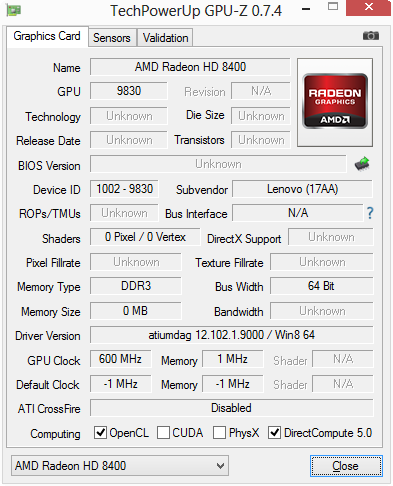 The Radeon HD 8400 GPU takes care of the graphics output. The core supports DirectX 11.1 and works at speeds of 267 - 600 MHz. It is one of the strongest IGPs of the 8000 series and aids the CPU with video decoding during playback, thus giving it more room to deal with other matters. The strongest IGP? That does not matter much: depending on the benchmark, the HD 8400 can either be level with the HD 4400 (Haswell, 3DMark 11) or the HD 4000 (Ivy Bridge, depending on the device). The performance can also be up to 40 - 60% lower (3DMark 2013). As such, we cannot wholeheartedly say that the HD 8400 beats the Intel HD Graphics (Haswell), which is the low-cost solution for the Celeron 2955U or the Atom Z3740. The latest games (2013/2014) can only be run to a certain extent on the HD 8400: less-demanding games like FIFA 14, Dota 2, Grid 2, Counter-Strike: GO or StarCraft II: Heart of the Swarm run fluidly at low details and resolution (no anti-aliasing). In the GPU information, the user will find a variety of games we tested on the Radeon chip. The fan of the S415 runs constantly. 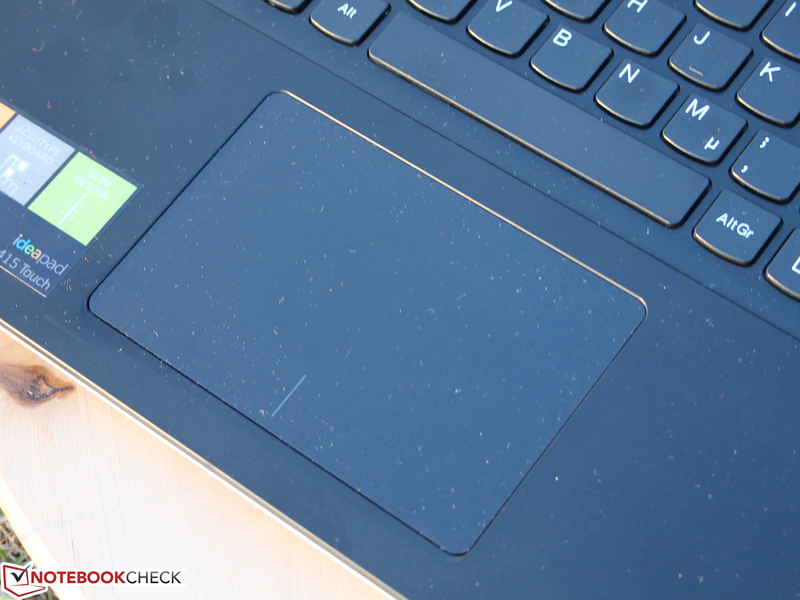 This occurs even during long periods of the laptop being idle and the cooling fan measuring 32.6 dB(A). We find this to be too much, especially as the laptop is quite weak in performance. The HDD is much quieter than the fan and its read and writes noises are just barely audible. Load shoots the emissions up: during the stress test, the emissions reached an annoying 44.6 dB(A). At low load, running 3DMark06, we reached 38 dB(A). We have had quieter systems, like the Aspire E1-532 (idle min. 30.4 dB(A)). 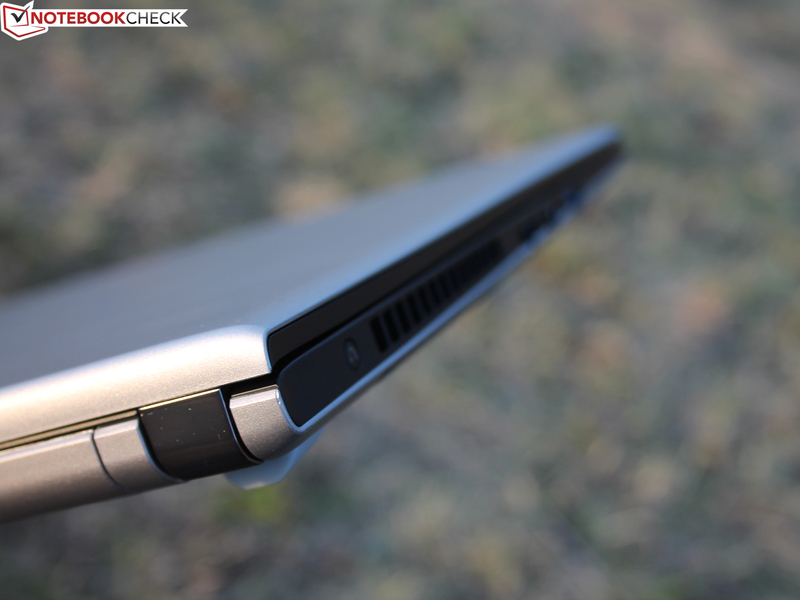 The VivoBook S300CA (31) and the IdeaPad Flex 14 (29) also stay much quieter. The constantly running fan leads to low temperatures on the surface. On average, while idle, the surface temperatures measure 26 °C (top and bottom). At load we detect two hot spots, which are slightly warmer (37 °C). The load was generated with a stress test, which pushed both GPU and CPU to 100% load. The low temperatures are nice and on the inside, the APU never exceeds 80 °C (inside sensors). Throttling is not to be found here as the APU runs at a constant 2.0 GHz. Two speakers are placed on the bottom, directly beneath the hand-rest regions. They produce an output heavy on the middle notes. It is lacking bass and differentiated high notes. The volume is quite good considering that these are laptop speakers, and the user can fill a small room quite nicely without distorting audio output. The power consumption while idle and at load is very low, lower than in the VivoBook S300CA (+38%) or even the Aspire E1-532 (Celeron 2955U) with +7%. While idle, the laptop consumes a mere 4.4 - 7.6 W, which is far lower than the 7.2 - 12 W of the predecessor. At low load, the S415 requires 20 W and at high load, the consumption can rise up to 32 W. All-in-all, the S415 is a very conservative notebook which is adequately supplied by the handy 40 W power adapter. The predecessor, the S405, had poor battery life. The S415 does a much better job in the practical WLAN test, despite its higher performance (quad-core): 29% longer runtime. This gives the user a full four hours instead of a mere 3 hours. 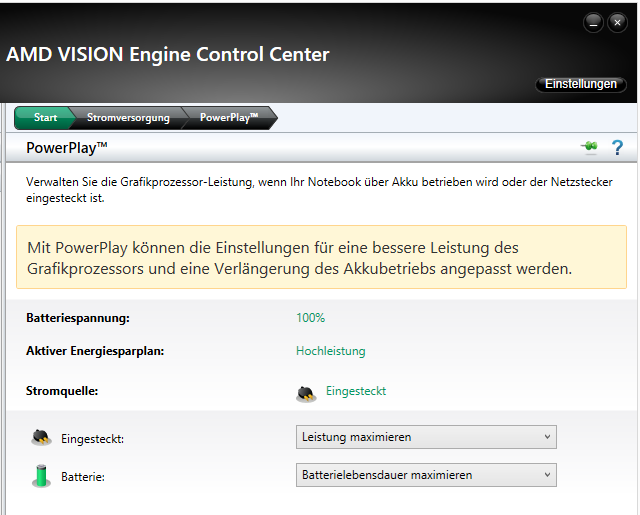 The Intel competition can do much better: for example, the VivoBook S300CA can last 11% longer in the WLAN test. The runtime is determined by the battery, and like in the predecessor, our test model is equipped with a meager 32 Wh battery. The competitors offer a lot more: IdeaPad Flex 14 (48 Wh), VivoBook S300CA (48 Wh) and Aspire E1-532 (37 Wh). As such, the shorter runtime is a fault in the design of the notebook. In fact, with the same battery capacity, our test model could outlast a Celeron "Low Voltage" system, due to its lower power consumption. Another try, but the same mistakes. The update to AMD's Jaguar architecture has boosted the performance to the level of the Intel competition of this price class (up to 450 Euros, ~$612). The 14-inch laptop is well-designed and attractive. Furthermore, only the cheap Celeron configuration of the Lenovo IdeaPad Flex 14 can offer a 14-inch touchscreen in this price class. Seen in this light, the S415 seems to have no competition. Still, cheap is not always good. 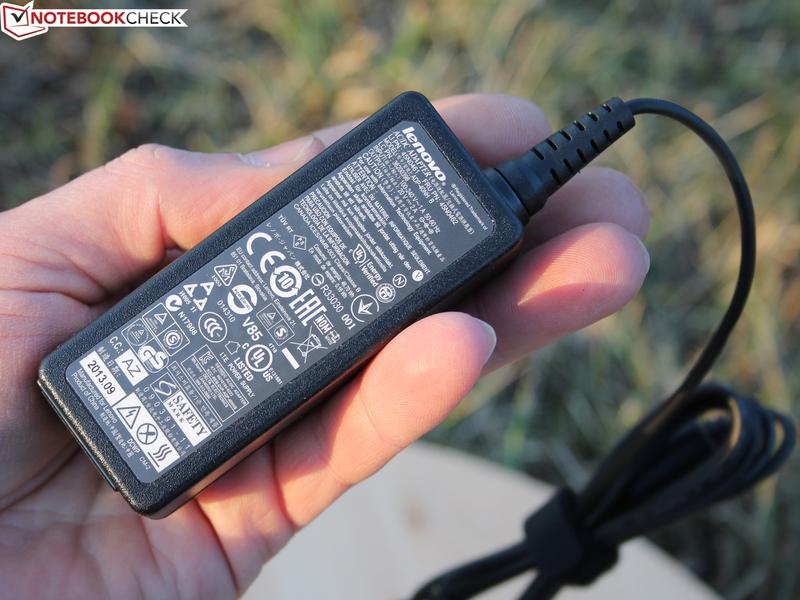 Lenovo does not make the most of this conservative platform as it chooses (once again) a weak 32 Wh battery. This clearly puts the Intel competition ahead in terms of battery life. The workmanship of the chassis is precise and the surfaces look good. The material is not very resistant and bends easily under pressure. The input devices are decent. The same goes for the temperatures (very low) and noise emissions. The shiny panel offers a relatively high contrast of 733:1, which is far better than we expected, but the poor viewing angles and strong blue tint mar the positive impression. 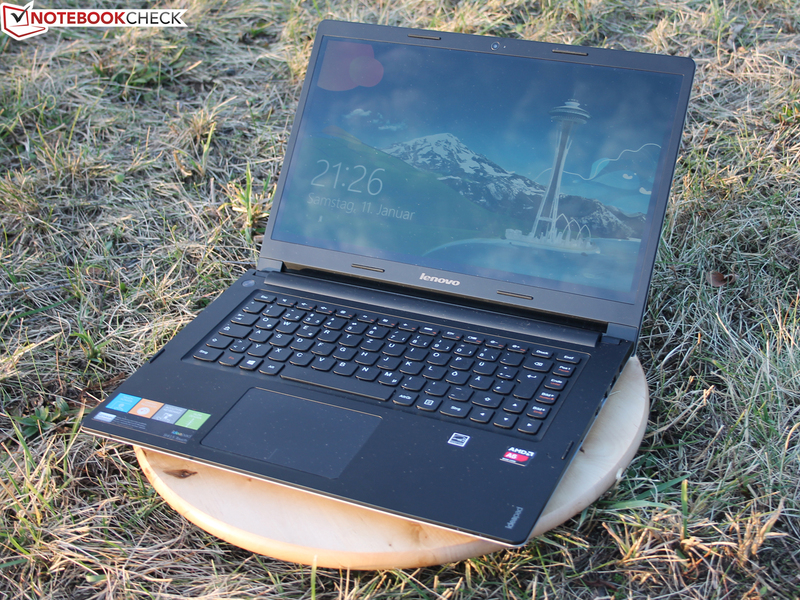 The Lenovo IdeaPad Flex 14 (with Celeron 2955U, 449 Euros, ~$611) is suitable for users who have little money, require a laptop and can live with the "Stand" mode of this notebook. The Asus VivoBook S300CA (13.3-inch, 589 Euros, ~$802) is suited for those users who want a well-built aluminum case, good performance and a display with good contrast. ...S405 released at the end of 2012. At that time, the 14-inch model was equipped with a conservative Trinity quad-core CPU. 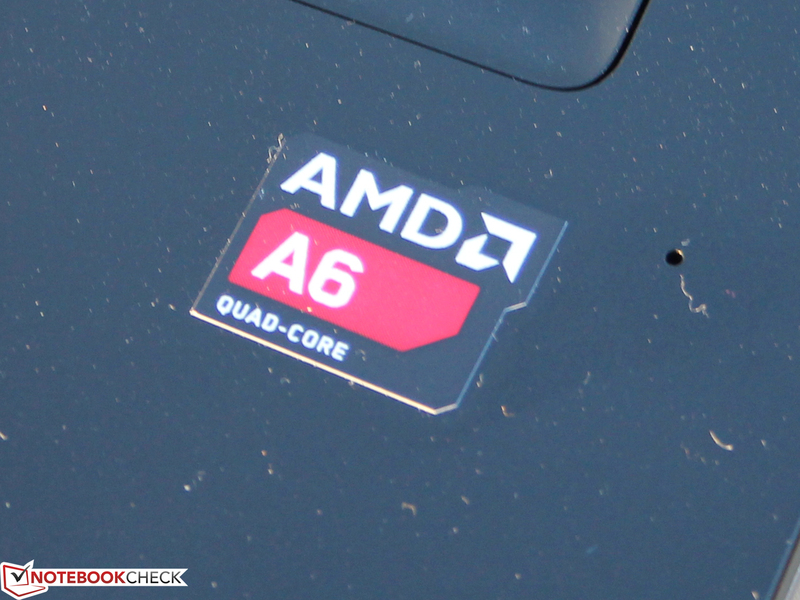 The S415 runs on AMD hardware: a quad-core. 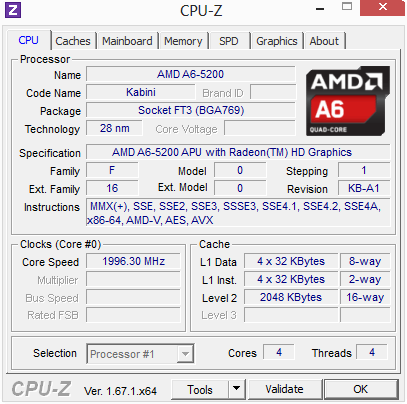 The processor is named AMD A6-5200 and comes from the Kabini platform (Jaguar architecture). The second addition is the touch panel which adds to the appeal of the model. 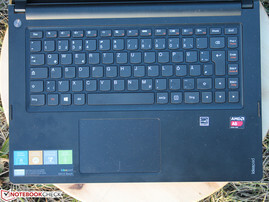 The rest stays the same as in the old S405: Lenovo has not managed to replace the weak keyboard. The flat chassis looks good (metal look) but consists entirely of synthetic material. ...but it only has a capacity of 32 Wh, which is not enough for a long time even with weak hardware. No change to the ports. A USB 3.0 has to suffice as VGA is not provided. 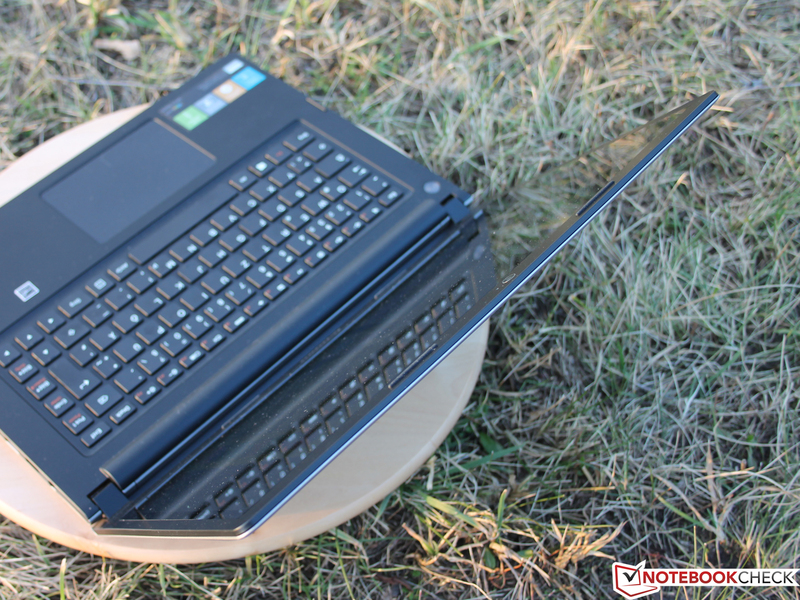 The laptop has a tasteful appeal, but the material is average (can be pressed inwards). 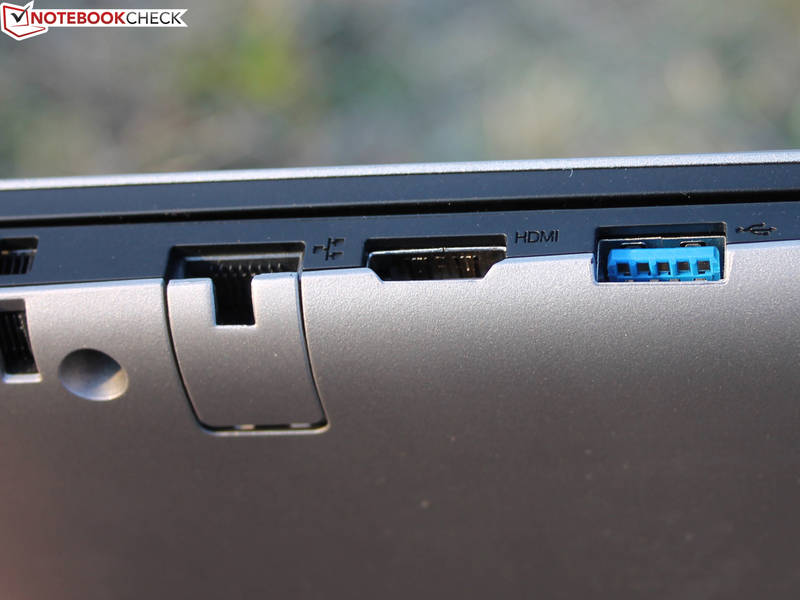 The tiny power adapter delivers 40 W.
Lenovo IdeaPad S415: Like in many other cheap laptops, the viewing angles are not great. 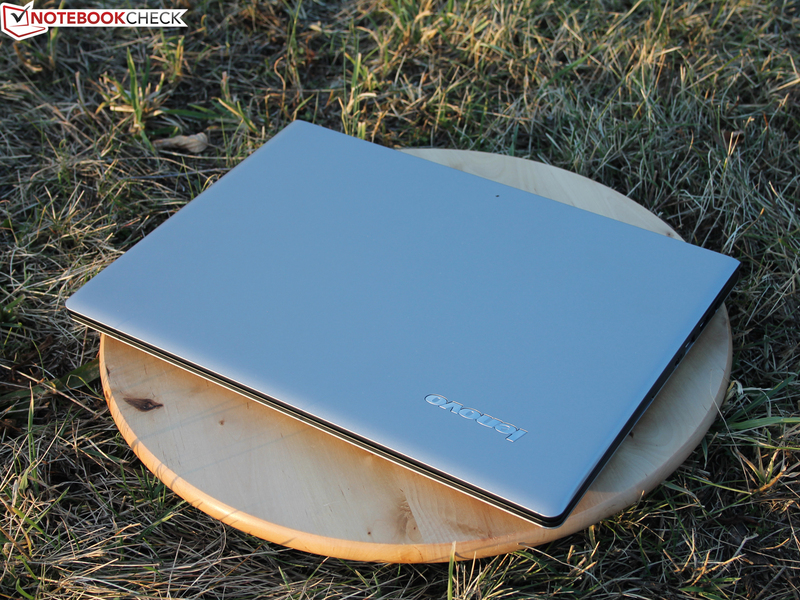 Lenovo IdeaPad S415: AMD A6-5200 for a small budget. The performance is decent but the HD 8400 is not good enough for gamers. ...for example, VGA is missing (also left out in the S405 at the end of 2012). The flat design, low temperatures and power consumption. More battery capacity and a fan which occasionally shuts off. 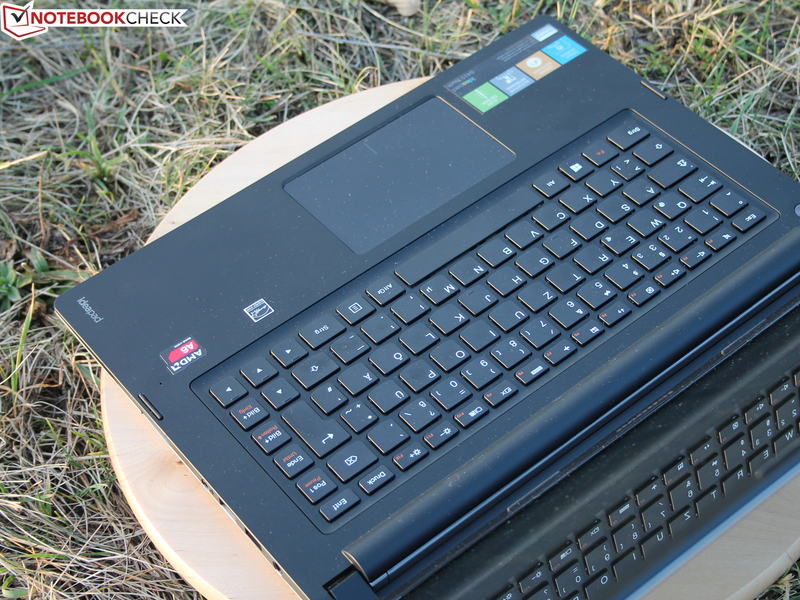 Lenovo skimps on the battery and misses out on a 14-inch laptop with great runtimes.